He's just shocked—shocked!—at what happened the other day, at least now that someone's finally noticed it. Brown's response here only prompts additional questions: Does someone else do his tweeting for him? (If so, this person is awfully prolific.) 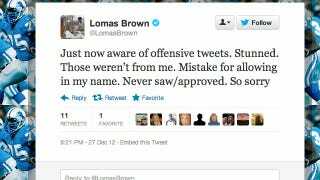 Does Brown ordinarily approve every tweet before that someone else presses "Send"? Was Brown—gasp!—hacked? Brown also apologized publicly yesterday to Scott Mitchell for saying he once deliberately didn't block for him, though Brown also said he initially didn't regret the play when it happened. At least he didn't blame anyone else.